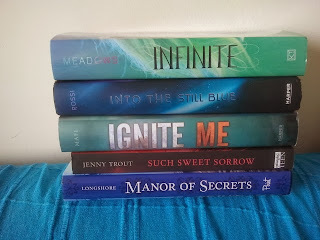 -Infinite by Jodi Meadows: I LOVED Incarnate! I haven't gotten around to reading the second book yet, but I just had to have the final book in the series because it's SO PRETTY!! I love these covers! -Into the Still Blue by Veronica Rossi: this is another series that I LOVED the first book from but have been failing from then on... But I need Perry and Aria and Roar in my life! -Ignite Me by Tahereh Mafi: so this is turning into a walk of shame, but I'm not caught up on this series either and I hear so many swoony things about Unravel Me's chapter 62... THIS NEEDS TO BE READ SOON! -Such Sweet Sorrow by Jenny Trout: Romeo and Juliet retelling?? YES PLEASE! -Manor of Secrets by Katherine Longshore: I LOVED Tarnish and Gilt and cannot WAIT to read this one! -Breaking Beautiful by Jennifer Shaw Wolf: I've heard so many good things about this book! I'm excited to read it myself! 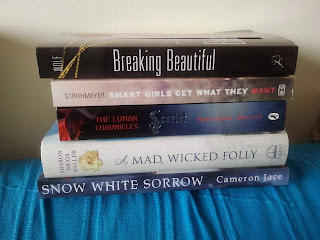 -Smart Girls Get What They Want by Sarah Strohmeyer: I adored How Zoe Made her Dreams (Mostly) Come True and Debby was raving about this one, so obviously it went on the must-buy-now pile. -Scarlet by Marissa Meyer: so this is a pretty big leap of faith for me, cause I've been hesitant about this series, but EVERYONE loves it and I decided to just give in to the urge to buy the second book just because. -Snow White Sorrow by Cameron Jace: "What if all you knew about fairy tales was wrong?" TELL ME that doesn't fascinate you?? -Unleashing Mr. Darcy by Teri Wilson: So I will basically read almost anything that has Mr. Darcy in the title! This sounds really cute! -Hexed by Michelle Krys: I AM EXCITED! This is one of my most anticipated debuts of 2014! -Knight Assassin by Rima Jean: Witchcraft! And the Knights Templar! EXCITEMENT! -The Hero's Guide to Being and Outlaw by Christopher Healy: if you haven't started this series yet, you should, because it is AWESOME! I laughed so hard at the first book The Hero's Guide To Saving Your Kingdom! Highly recommended! -Stolen Songbird by Danielle L. Jensen: Mel has been raving about it and it sounds so exciting! -Renegade by Debra Driza: I haven't read Mila 2.0 yet and I hear mixed things, but I'm still really curious, so I will give this series a chance. -On the Fence by Kasie West: I LOVED Pivot Point and this just sounds ADORABLE! So yes I WILL READ THIS! I really have to check out MANOR OF SECRETS, I just loved A MAD, WICKED FOLLY! I hope you do too. I have to check out SNOW WHITE SORROW. That blurb has be intrigued. I didn't receive any books, but received a book plate that I show in my post that will be up tomorrow. I just read Cinder, and I loved it. I can't wait to read Scarlet. I hope that you enjoy the series! SO PRETTY. 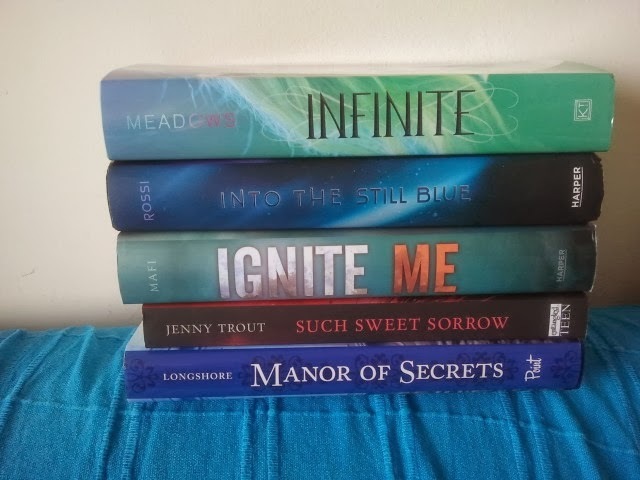 Those hardbacks are just gorgeous, I didn't enjoy the US covers of the Under the Never Sky series but seeing the spines next to each other, they're so pretty! SO much amazingness here! 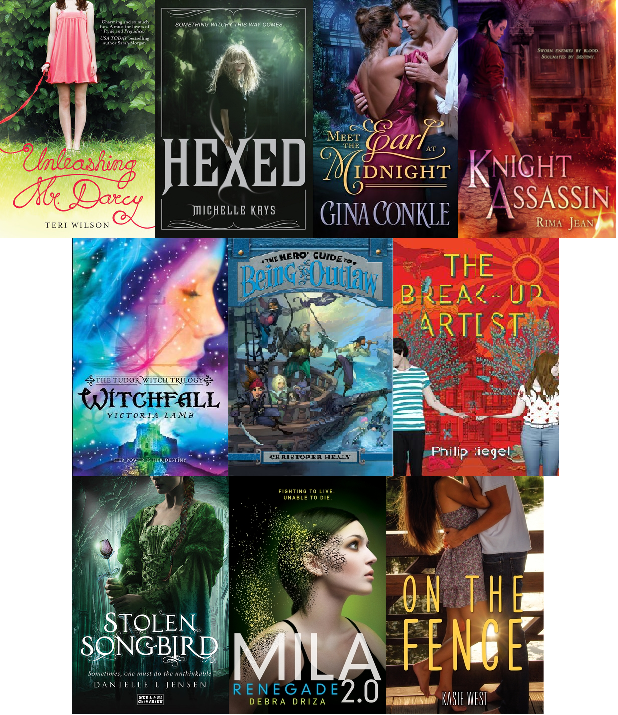 I am hoping to get accepted for Witchfall since I liked Witchstruck and I wasn't into the whole Scarlet/Cinder,Cress series but everyone says it is AMAZING so, like you I feel I should give it a try. I really want to read A Mad Wicked Folly and just the side of Infinite looks prettY! I hope you enjoy all the reading! The cover of “Witchfall” is just so pretty! I have Manor of Secrets in one of my piles, too. So excited. Enjoy your books. I'm definitely going to have to read A Mad, Wicked Folly!